Rebecca: Not Really a Ghost Story – The Bookshelf of Emily J. When I picked up a copy of Daphne du Maurier’s Rebecca (1938), number 15 on the BBC Book List, I couldn’t help but think, “Is this a romance novel?” You know, one of those with a picture of Fabio on the cover caressing a voluptuous woman? The paperback copy I have (pictured below) has some sort of red swirly design, that looks like the silk curtains of desire. I felt doubtful. Would I really be able to read this book? I was pleasantly surprised. Rebecca is about a plain girl who marries an older man for love on a whim during a vacation, and when she returns to his home, she finds he has been widowed. Traces of his former wife, Rebecca, are everywhere and the second Mrs. Maxim de Winter, whose name is never revealed, is caught in the middle. She begins to wonder why he married her and if he still loves this Rebecca, as all of the house staff seem to. They take every opportunity to remind her of why she isn’t as good as Rebecca, and each attempt to move or reorganize something is met with rabid resistance from Mrs. Danvers. At one point, the novel turns into a ghost story, without a true ghost. The ghost is just the memory of Rebecca, but as a reader I anticipated an appearance of the occult at some point. I was disappointed, but not truly because at the appearance of a ghost I probably would have felt my blood go chill, finished the chapter, then spent the next few nights jumping into my bed from 10 feet away to avoid a witch grabbing my ankles from under the bed. I also would have developed a habit of turning on every light in the house at night for a bathroom trip or to answer the call of a wailing child. I have a vivid imagination when it comes to ghosts. I still remember the blood curdling tale of Bloody Mary in the mirror from third grade folklore. I still don’t look into mirrors in dark bathrooms, and I avoid dark bathrooms like the plague. Anyhow, no real ghost appears, but Rebecca’s power as a dead woman over the household is just as frightening. The plot twist is worth the read. I won’t reveal it so you can read Rebecca if you haven’t. Let’s just say that the reason for Rebecca’s death is revealed. So instead of a romance, this novel is a mystery. If you like Rebecca, the next logical step is Rebecca’s Tale (2001) by Sally Beauman. This novel continues the story, explaining a fire and moving onto the next generation to further unravel the mystery of Rebecca, Mr. and Mrs. Maxim de Winter, and Mrs. Danvers, who becomes an enigmatic figure in this tale and leads the new protagonist to answers and more ghost-like mysteries and suspense. It is a dense book and hard to follow at first, but the addition to the plot of du Maurier’s original tale is worth the serious reading. And as a side note, the author of Rebecca’s Tale, Sally Beauman, happens to be married to Nicola Beauman’s ex-husband. I know. You’re like, who’s Nicola Beauman? Well, she’s the owner of Persephone Books, a London-based publishing house that is reviving and reprinting forgotten women’s literature. Nicola Beauman is the reason I fell in love with Dorothy Whipple’s work. She’s brilliant and I admire her. And, she’s accessible. I once emailed her with a question as part of my graduate studies. She responded promptly, helpfully, and kindly. Back to Daphne du Maurier. I named my youngest daughter Daphne. I think the name is beautiful. I didn’t name her because of du Maurier. 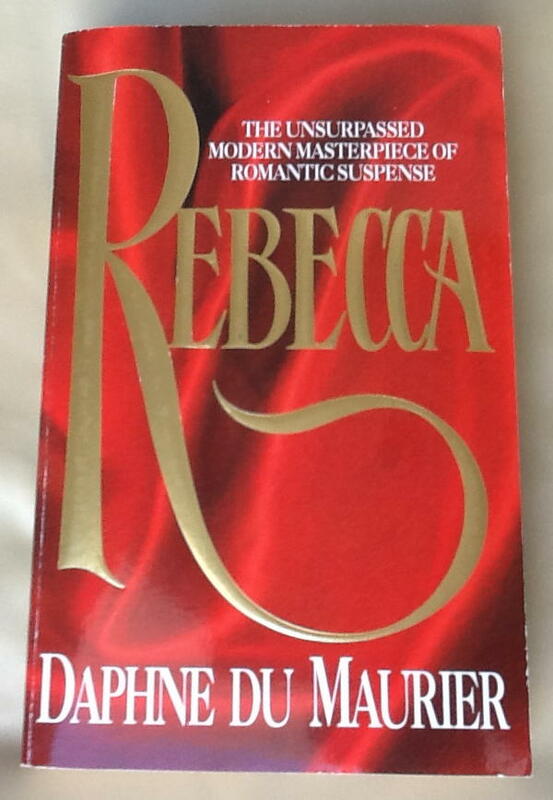 I hadn’t even read Rebecca when she was born, but I’m glad that I like the book or I might have made some unpleasant associations with the name if it had turned out to be a corny romance novel. And while we’re on the subject of romance, there is an actual genre of literature that falls into that category. It has nothing to do with trysting lovers or magnificent muscles. The romantic period of American literature featured writing that was fantastical and plot twists that were unreal and other worldly. An example is The Scarlett Letter. Never in the history of the world has a scarlet “A” burned itself into an adulterer hiding his own shame, but in that novel, it does, and satisfyingly so. What followed the romantic period of novels was realism, which seemed to start with Mark Twain’s fantastic tale The Adventures of Huckleberry Finn. I recently reread this novel and will be writing about it soon. I went off on another tangent. Apparently, I don’t have much to say about Rebecca. I guess my point of this post, if I have one, is that I enjoyed Rebecca and I think you will too. I thought the same thing when I picked up Rebecca. I was almost embarrassed to buy it at the counter in my local bookstore. I love Rebecca too, but they pub’s need to seriously reconsider that cover art. I agree. It is so misleading! I avoided the book for a while because of it. I did enjoy this book and was unaware that some one wrote a sequel. I will have to check it out. Also I found it was very interesting that the author never tells us the new Mrs De Winters name. I never noticed until I read it a second time. Finally have you seen Alfred Hitchcock’s 1940 version of Rebecca. I saw it one night on PBS and that is how I was first introduced to Rebecca. Great movie! I haven’t seen the movie. But, I am going to now! Thanks for the recommendation. I love Rebecca and the name Daphne! Great review! Thank you! I’m just hanging out and watching Curious George with my little Daphne right now. It is a beautiful name. I have been coming back to this book for a while and everytime i look at the cover, I gag and put it write back on the library shelf! Maybe, its true. Do not judge a book by its cover. But, the author/ publisher should really consider a change soon!!! This is one of my favourite books! I have read it 3 times (and I rarely re-read anything). The only other book I have ever re-read is Anne of Green Gables, and I’ve probably soaked that one in 4 or 5 times. I did not realize there was a sequel of sorts, I will be looking into it. Thank you. I bet you’ll like the “sequel.” I rarely reread either, but sometimes it is worth it and necessary! This is one of my all-time favourite books. I read it on holiday in Cornwall, and absolutely loved it. I figured you would have a post about “Rebecca”. I may or may not have read it until 3am last night. For some reason, it was so gripping and suspenseful that I sacrificed my favorite thing for it: sleep. So worth it. It is a good one! I love that you gave up sleep for it. That’s a mark of a good book. This has been on my list for ages. It’s nice to have a good review of this book from someone. Thanks! You’re welcome. Enjoy the read. This is a fun one! Pingback: A Little Du Maurier | The Bookshelf of Emily J.